Weinheim (Germany), October 9, 2018 – In fuel cells, gas diffusion layers from Freudenberg ensure that hydrogen (as an energy carrier) and oxygen (as a reactant) are distributed across the polymer electrolyte membrane (PEM) as evenly as possible. The more homogeneously the gases flow into the membrane, the more electric current is generated onboard a fuel cell vehicle. These layers are becoming thinner and thinner to minimize installation space and to achieve the best possible heat transfer. Freudenberg Sealing Technologies has developed special seals that are attached directly to the gas diffusion layer and facilitate very thin cell designs. Since they seal the outer area of the PEM, the edge of the membrane does not require reinforcement. The climate goals of the Paris Agreement can only be met if all forms of transportation are gradually electrified. Aside from the growing use of battery-electric powertrains, fuel cells are playing an increasingly important role in buses, heavy-duty commercial vehicles and construction machinery. Freudenberg Sealing Technologies estimates that the fuel cell will reach a global market share of 40 percent in mobile applications by 2050. The principle behind them: A fuel cell consumes hydrogen as its fuel, transforming its energy into electric current. The electricity drives an electric motor. This involves the migration of positively charged hydrogen protons from the anode through a thin polymer electrolyte membrane (PEM), which is coated with a catalytic material, to the cathode, where it reacts with oxygen to form water. This results in a surplus of electrons from the hydrogen at the anode. If they are connected to the cathode with a separate electric circuit, they will migrate there. This produces electrical energy. The membranes for the gas exchange need to remain uncontaminated to extend the fuel cell’s operating life. The same is true of the bipolar plate that serves as the carrier for the individual elements of a fuel cell stack and handles the rough distribution of the gases. In addition, the gases must not escape into the environment and the hydrogen must not come into direct contact with the oxygen. This makes it essential to securely seal the gas diffusion layer. Freudenberg Sealing Technologies seals also serve another important purpose within the cell: They compensate for dimensional variations that may result from the expansion of adjacent components due to heat or other factors. As part of a new Freudenberg Sealing Technologies sealing concept, an elastomer seal is applied directly onto the gas diffusion layers during the injection molding process. 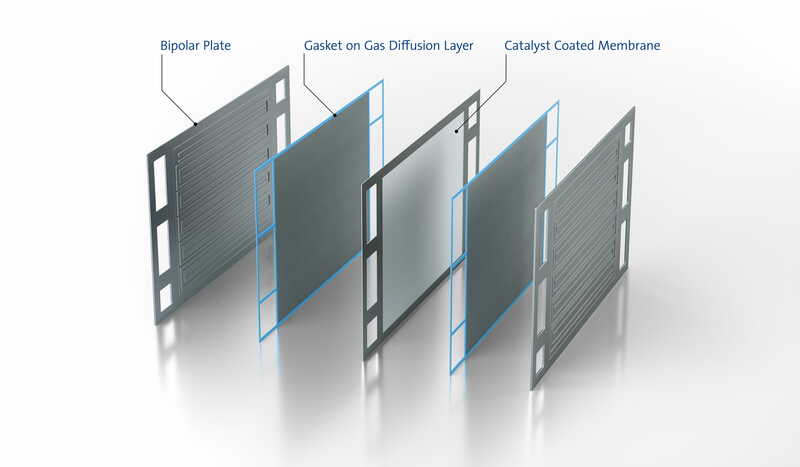 The layers handle the fine distribution of gases and other tasks such as the transport of heat and water on both sides of the polymer electrolyte membrane. The PEM forms a compact and secure sealing unit with the gas diffusion layer that it encloses. 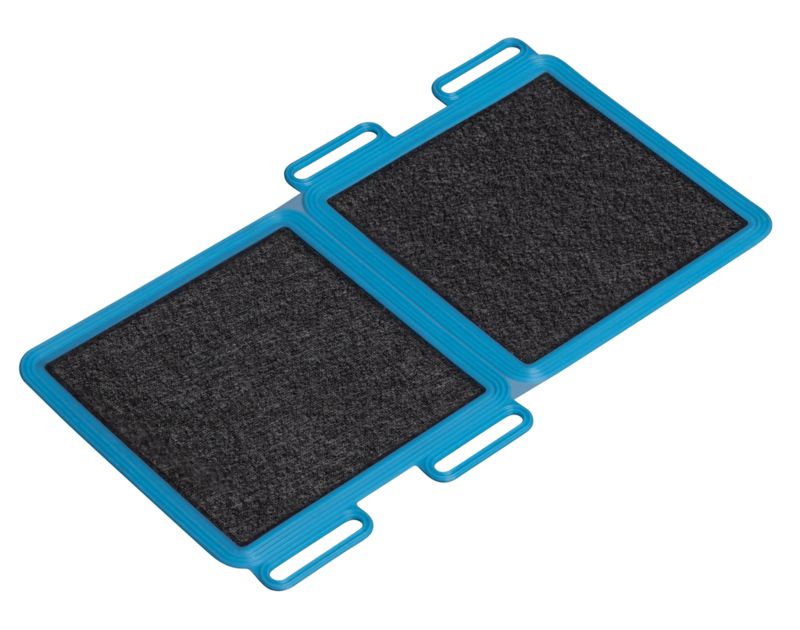 The unit can be attached between the bipolar plates of a fuel cell stack, which are responsible for the gross distribution of gases and the transport of electric current. The new concept permits thin components to be designed and eliminates the need for edge reinforcement, in the form of two polymer films, that would have otherwise had to be glued onto the membrane’s edges. As the material for the new seal, Freudenberg Sealing Technologies turned to an elastomer especially developed for use in fuel cells. Among other characteristics, it needed to feature good resistance to heavy moisture, to temperatures from 80 to 90°C, coolants and acidic environments caused by the PEM’s electrolyte material. The elastomer must exhibit the lowest possible permeation so the reactive gases only diffuse minimally through the seal. The geometry of the seal fulfills two functions: first, it must securely enclose the PEM between the two gas diffusion layers. This is ensured by a seal edge applied directly to the border of the gas diffusion layer. Secondly, it must also seal the apertures in the bipolar plates where the supply channels of a fuel cell stack run and where the hydrogen, oxygen and coolant flow. The seal also features additional, outer seal lips for this purpose. Since it is directly attached to the gas diffusion layer, the seal makes it easier to assemble fuel cell stacks. It is also a major advantage that both the gas diffusion layer and the seal come from the Freudenberg Group. It takes a precise understanding of the individual materials and the manufacturing process to produce the two components in an injection molding tool. For example, the tool must firmly enclose the installation space for the elastomer, yet it cannot be allowed to damage a gas diffusion layer, which is only a few tenths of a millimeter thick. 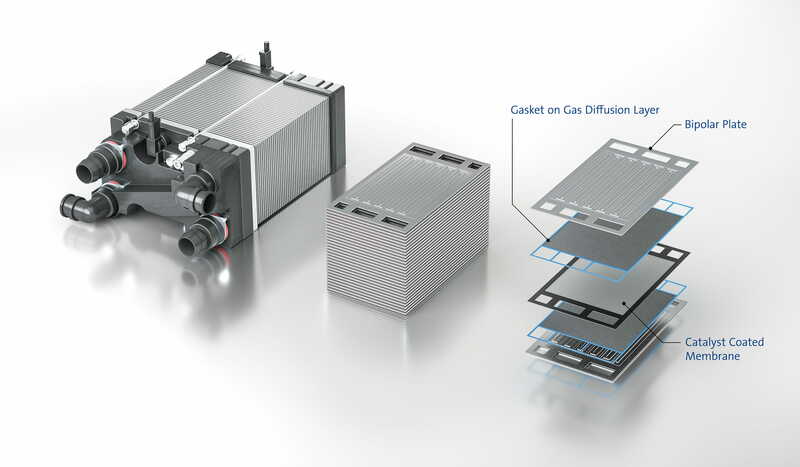 Working with a German supplier of fuel cell modules, Freudenberg is now developing seals for gas diffusion layers and fuel cells to series-production readiness. You can subscribe to the Freudenberg Sealing Technologies news alert service, bringing you the news as soon as they are published. You can always unsubscribe from this service. Matthew Chapman will take over as the new President of Sales and Marketing for the automotive business. Freudenberg Sealing Technologies Is Working on New Sealing Solutions for Large Lithium Ion Batteries. Company experts explain the special requirements of the new drivetrain technologies during a SAE webinar. Learn how E-mobility is impacting material and technology developments in the industry. During even-numbered years, everything at the IAA revolves around commercial vehicles. One trend is unmistakable this year in Hannover: Vehicle manufacturers and suppliers want to demonstrate that they are well-prepared for the age of electric mobility. Freudenberg Sealing Technologies has developed plastic pistons for hydraulic accumulators that rely on single-part sealing technology and ease installation challenges. At the Battery Show North America 2018, Freudenberg will present a broad portfolio of products and solutions that improve safety, quality and long-term reliability of batteries. A tailor-made entry into the automotive business: The Junior Key Account Management Program at Freudenberg Sealing Technologies. Freudenberg Sealing Technologies’ CEO Claus Moehlenkamp speaks about automotive industry disruption at CAR MBS 2018 in Traverse City, Michigan.